As you can tell from the title of this column, I have slipped back into my former English language arts life. That happens for me from time to time. Prior to becoming an administrator, I taught English language arts and speech communications at the high school level. I think there is, deep within the inner workings of English teachers, something about language we simply cannot repress. I know my children endured my grammar mini-lessons on many occasions. "You do not feel good; you feel well." "Regardless, not irregardless." "It's not who are you going with; it is with whom are you going." Anyone who knows an English teacher has likely experienced similar suggested adjustments. Sorry. We simply cannot help ourselves. Action verbs and linking verbs—they have direct implications for leadership. My guess is there may be some who are scanning this article who have forgotten the difference, so let's define these terms before we make application to the realm of leadership. I use as my source for the definitions Dictionary.com. A linking verb "links the subject with the complement of a sentence." In other words, linking verbs connect the subject of the sentence with an adjective or a noun that describes the subject. Sometimes we refer to this group of words as "being verbs" because they express a state of being. Linking verbs do not describe what someone or something does; they simply describe what or who they are. Consider the statements below. "The principal is an advocate for teachers." The linking verb "is" links "principal" to "advocate". "She feels confident we can raise our test scores." The linking verb "feels" links "she" to "confident". "I am committed to children." The linking verb "am" links "I" to "committed". 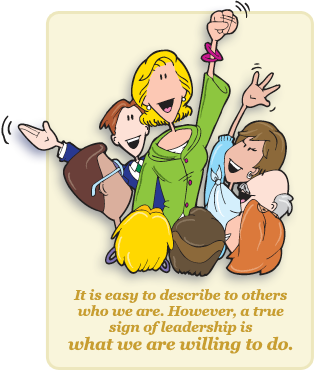 Descriptions of leaders such as these noted above are certainly admirable. However, the real question is this—do these "states of being" result in action? An action verb, on the other hand, "…expresses something that a person…can do." Action verbs do not describe a state of being; rather, they describe an action. The sentences below contain action verbs (i.e., see the underlined terms). Effective leaders coach teachers in the classroom. Strong leaders establish expectations for teaching and learning. Successful leaders create support systems to ensure successful implementation. It is easy to describe to others who we are. However, a true sign of leadership is what we are willing to do. There is an age old adage in our society that expresses this truism—actions speak louder than words. Influential leaders do not simply describe for others who they are or even what they believe. True leaders, those that people will follow, are people of action. What are you doing to create focus in your organization? What are you doing to support educators in your organization? What are you doing to institutionalize change? What are you doing to influence those under your supervision? Leaders who act shape the beliefs and behaviors of others in a constructive manner. Don't be misled. Leading with action verbs can be challenging. There will be times when some will oppose you. There will be times when some will wish you had remained hidden in your office. There will be times when some will question your activities. Nevertheless, those of us who signed up for leadership need to understand that this comes with the territory. We are entering a pivotal time in educational reform. We need leaders who will act on what we know makes a difference in student learning. In doing so, we will narrow the achievement gap that exists in our country. Lead with action verbs not linking verbs. I know in doing so, you will not only positively impact educators and students, but you will also gain a sense of accomplishment in doing what you have been called to do. If we can assist you in your activities, get in touch with us. We would be honored to come alongside and support you in your efforts.